If you guys flip through my blog in the last few months, it would be very apparent that I’m slightly addicted to holographic nail polishes at the moment. I want to say its just a phase, but I have a feeling this is going to be a life long addiction. I had a few holographic polishes before the Zoya Ornate collection and the Color Club Halo Hues but none that I ever truly appreciated. After the Halo Hues, I had to try out my old holographics and purchase a few new ones. I first saw this polish on my friend Radha, The Polish Owl, and knew I had to have it! I was scared the orangey gold tone would clash horribly with my skin. Well, it definitely does clash with my skin and kind of looks like crap on me but I don’t care! I am so in love with this polish that I’ll suffer through the cringes! 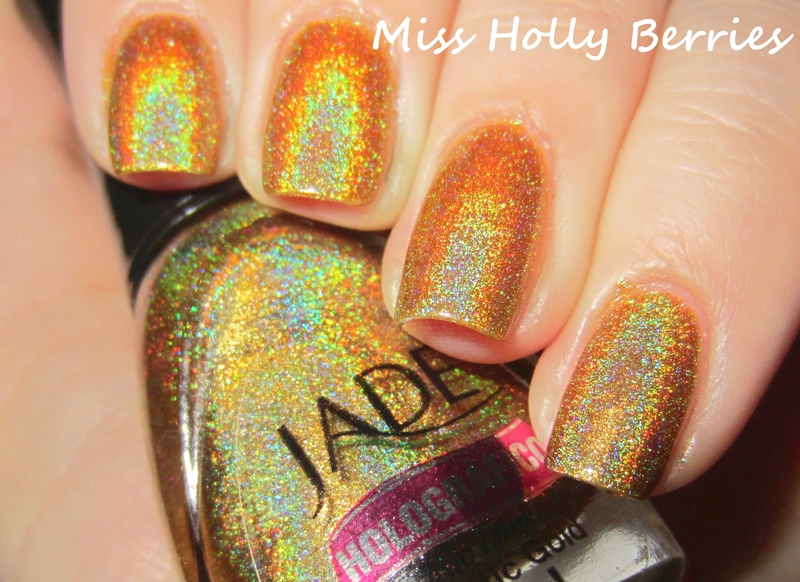 Jade “Mystic Gold” is a brassy gold holographic and its absolutely stunning. 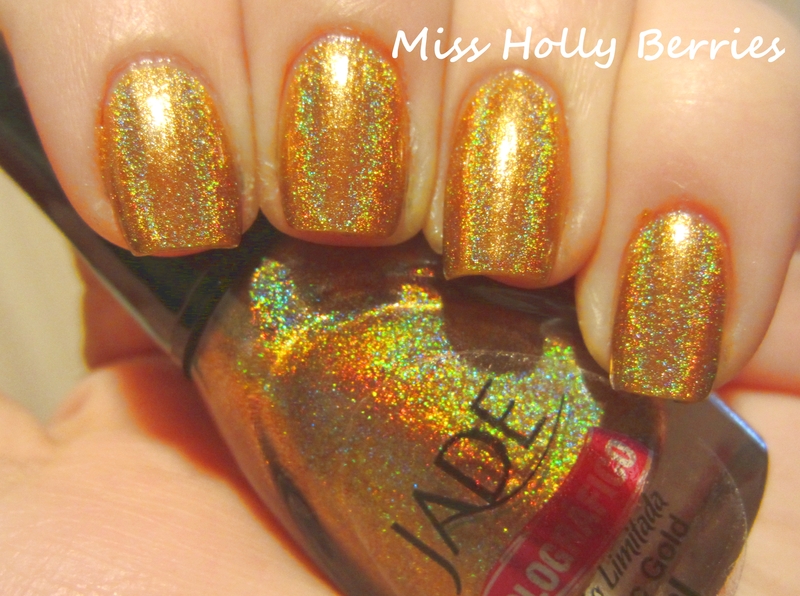 Its one of the strongest holos that I have in my collection! The gold tone really doesn’t do my skin tone any justice. I think it would look much better on someone with a darker skin tone. The formula is just ok. It took 2 coats to reach full opacity and was a breeze to apply. The dry time was a little slower than I thought it would be, but nothing so slow as to really complain about. I’m just spoiled with the fast dry time of the Halo Hues. What do you guys think? What are your favorite holographics? What are your favorite golds? of course i do! i love your blog and i wish i had all your knowledge about nail polish and indies, you are like the queen of polish! i did too i kept looking for different lights so i can see it sparkle! lol i completely understand your feelings! my wallet hates when i look around on different blogs. let me know how you like the jade polishes, because i’m contemplating picking up a few more!